The question of whether or not Freemasonry is compatible with the Christian faith is one that has confronted churches and believers for many years. But what are the most important concerns that every believer should be aware of? Does Masonry merely consist of private membership in a secret club? Or are there important theological issues at stake – especially for Christians? In this dynamic audio CD, documentary filmmaker Christian J. Pinto answers these questions, while featuring interviews with fellow researchers, Carl Teichrib and Ed Decker. Also featured is an exclusive interview with a Master Mason who explains the truth about the philosophies of the Craft. This resource is ideal for those looking for solid research that compares Masonic teachings against the Bible. 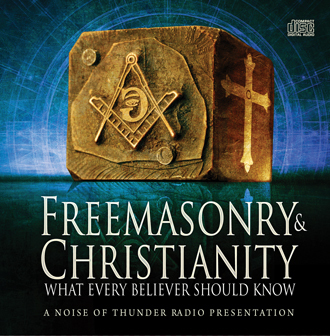 This audio CD differs from our previous CD on Freemasonry in the Church, in that it goes step by step through Masonic teachings, and presents reasons why Christians who may be interested in Masonry should be concerned about joining a local lodge, or embracing Masonic philosophy.